With enhancements across the board, an all-new interior and a fully revised body structure, Mazda claims that the all-new CX-5 raises the bar even higher, delivering new levels of style, refinement and driving pleasure. Inside, Mazda’s human-centric development ethos delivers an interior that merges meticulous cockpit ergonomics with a sophisticated, high-quality, and spacious cabin environment. A product of Mazda’s ‘Jinba-Ittai’ car-and-driver as one philosophy, the Mazda CX-5 delivers new levels of driver engagement and comfort. With particular attention paid to reducing noise and vibration within the cabin, the CX-5 provides unmistakably premium levels of comfort and refinement, while at the same time improving on the class-leading handling precision and driver involvement of the outgoing car. 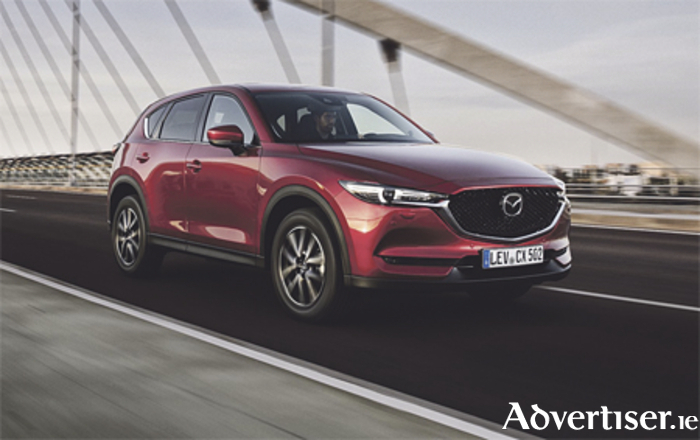 With 15 per cent stiffer torsional body rigidity than the outgoing model, refinements to the steering, suspension, and brakes, plus the introduction of G-Vectoring Control (GVC ), the all-new Mazda CX-5 is more comfortable, refined, and responsive than ever. Available in three highly specified trim levels, the nine-model Irish range starts at just €28,995. Both Mazda’s SkyActiv-MT six-speed manual and SkyActiv-Drive six-speed automatic transmissions feature in the range, as does the latest generation of Mazda’s intelligent i-ACTIV all-wheel drive (AWD ) system. Powered by a familiar range of SkyActiv engines, the 2.0-litre 165ps SkyActiv-G petrol engine is available in Executive, Executive SE, and Platinum trim, and is offered exclusively with front-wheel drive and Mazda’s six-speed SkyActiv-MT manual gearbox. The popular 2.2 litre 150ps SkyActiv-D diesel is available with front-wheel drive and i-ACTIV AWD and comes with a choice of SkyActiv-MT or SkyActiv-Drive gearbox. The flagship 2.2-litre 175ps SkyActiv-D comes exclusively in Platinum trim and is equipped with Mazda’s i-ACTIV AWD with automatic transmission. Across both outputs, the SkyActiv-D diesel engines have been enhanced with the introduction of Mazda’s noise reducing ‘Natural Sound Smoother’ technology. In addition, ‘Transient Control’ sharpens throttle responsiveness by more precise control of engine torque with optimised turbo pressure and finer adjustment of fuel injection. All models feature a generous standard equipment tally that includes LED headlights, 7” colour touch-screen display and ‘Smart City Brake Support’ (SCBS ). Platinum models add to this with a host of premium highlights including a reversing camera, eight-way power adjustable driver’s seat and Smart keyless entry, plus heated front seats and steering wheel. Offered in a Mazda for the first time, Platinum models also feature a power lift tailgate, plus a new head-up display (HUD ) that projects directly onto the windscreen and features ‘Traffic Sign Recognition’.